As I noted in an early post of this blog, I’ve been struggling physically for a few years, and have tried a bunch of therapies to try and avoid a knee replacement. Ultimately, nothing worked, and I had my knee replaced on May 17. Today marks 16 days since surgery. It feels like forever, but as my PT reminded me yesterday, it’s really still very early days. If you know me, you know that sitting around doing nothing isn’t a strength, nor is patience. I’ve been forced to do the first, I’m learning to have the second. Most of the time. FMG has been amazing. Truly, ridiculously amazing. I could never in a million years do this without her. She never signed up to be a full-time caregiver, but that’s what she’s been forced into. She keeps telling me that I’d do the same for her, and I really hope that is true. I guarantee that if I was put in the position, while I might do it, there’s no way I’d do as well as she is. I will forever be grateful to her. She’s the best. I can’t begin to express how lucky I am, and how much I love her. I decided to do a two-week recap after my PT reminded me of all the progress I’ve made. Thursday was really tough, and Friday (before he came) started out pretty badly.It’s really easy to lose perspective when you’re essentially bed-bound and have lots of idle time and a fair amount of pain to get lost in. I fell in the trap of myopically focusing on that and feeling somewhat hopeless, until he reminded me of all the progress that I’ve made thus far. Today, my staples were removed. That is a big step. There were 55 of them. Even though he had removed the watertight Aquacel dressing on Monday, I couldn’t bring myself to really examine the wound until Thursday. This is my first surgery of any type, and I was repulsed by the thought of seeing my own knee disfigured. FMG snapped this right before they wheeled me in. I remember nothing. Except waking up and pulling that IV out. 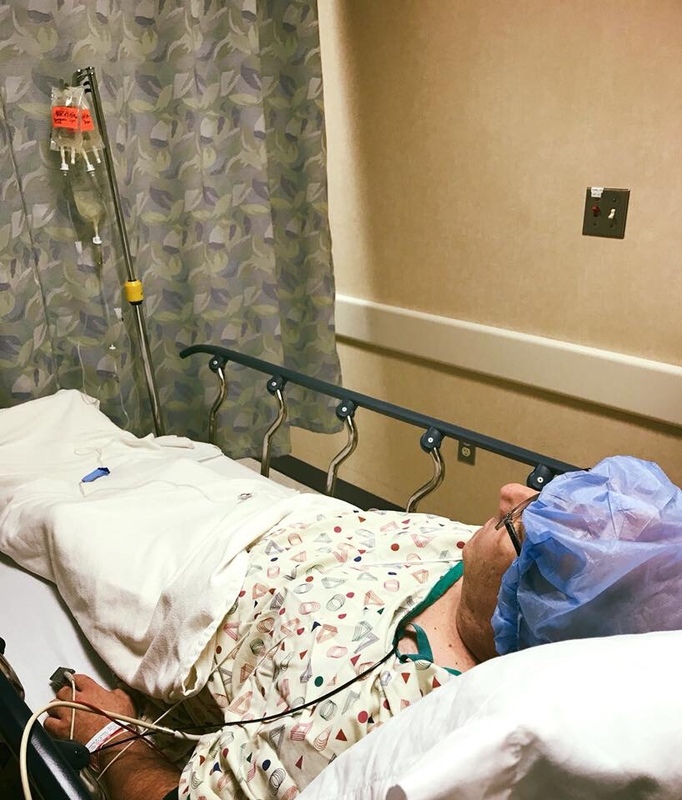 Don’t get me wrong, I knew what was under there and have seen enough pictures (including those of a friend who also had a TKR a few weeks before me) to know what to expect. I just didn’t want to look. I’m the guy that doesn’t want to watch pre-op videos of procedures, and who gets freaked out by graphical medical dramas. Thursday, I got up the nerve to count the staples, knowing they were coming out Friday and I’d forever kick myself if I didn’t know how many there were. I counted 43. As noted above, there were actually 55. I’ll blame Percocet for my lack of math skills. I’m still forced to use a walker to move around, but am now using it more for balance then for holding me up most of the time. That’s progress. I’ll have to use it for another 4-6 weeks (and a cane after that) because the risk of falling (and damaging the new knee, etc) is the biggest risk factor remaining. I’ve only left the house once thus far. Tuesday I woke up feeling good, and told FMG that I’d like to go somewhere, just to get out and get some fresh air. I managed to get into the car in the garage fairly easily, but as soon as I was seated, I felt I was going to throw up. In the week and a half I’d been “stuck” inside (in glorious air conditioned splendor), heat and humidity had arrived in Georgia. I had no idea. The heat and humidity hit me like a hammer. Once we got the air going, I was OK. I didn’t really care where we went, I just wanted out. We ended up driving a few miles down to Reality Bikes to visit with my friend Todd Muller. I managed to get out of the car and onto my walker and walk myself into the shop all the way back to Todd’s office sofa. Along the way, Michael Barman tried (and failed) to engage me in a conversation. I was basically delirious. Franklin Paine said I looked like I was 100 years-old and the kind of guy who owed people money from gin rummy. Friends. We stayed about 20 minutes and headed back home. Round trip, less than an hour. I slept 4 solid hours after, I was so exhausted. That ended my short lived desire to get out, at least for a while. PT is grueling. Some people use the term torture. I avoid that comparison because I am trying to focus on the expected positive outcome. I have 9 different exercises (at this point) that I am suppose to do 15 reps of anywhere from 3-6 times a day. My left quad is the biggest issue I am fighting. It is essentially locking up after a few reps of any exercise that stresses it (most of them, unfortunately) and that makes it tough to do everything I need to. I was in tears Thursday because of the general pain; and the specific pain of the exercises themselves; and the frustration of not progressing. My PT knew this (I keep in touch with him by text) and came prepared for a patient in need of motivation and encouragement on his visit Friday. The good news is that all the objective measures (knee bend, knee flex, the knee sitting flat, etc.) are tracking fine. I am progressing, even though I can’t do everything I need to, all the time. My surgeon mandates that you not bend the knee back more than 72 degrees for the first two weeks. I’ve been able to do that much flex since PT started, the day after surgery. Today was the first day to go further, and we did: 80 degrees, despite my quad shaking and vibrating like a 72 VW Beetle climbing Alpe D’Huez (or the way I shake when riding up a moderate hill in Georgia). Let’s just say it hurt. A lot. My PT assures me that the quad muscle will release at some point. I hope that point is very, very soon. I’ve learned to sleep on my back, with my leg in an immobilizer, which is as pleasant a device as it sounds. I’m still limited largely to staying downstairs, but have ventured upstairs every couple days to our walk-in shower with a bench seat. Honestly, stairs aren’t any harder now then they were before the surgery, I’m just forced to be very careful, again because of the risk of falling. My two older dogs, Lula and Ripley, are my protectors, and Ripley is my nurse. She rarely leaves my side, sleeping with me downstairs, and staying at my side all day, every day. She’s my constant companion and my chief comforter. Amazingly compassionate. Scarlet is a little harder, because she still has puppy crazy going on, but every day I am able to spend more time with her and she is slowly getting used to not jumping up on me. She is driving Ripley insane, though, because Ripley goes into protective mode when Scarlet is around me, fearing she’ll jump up and knock me down. Ripley is very attuned to me and what is dangerous or needed. I mentioned on FB that the thought of going up our stairs seemed equivalent of climbing Mt. Everest to me. 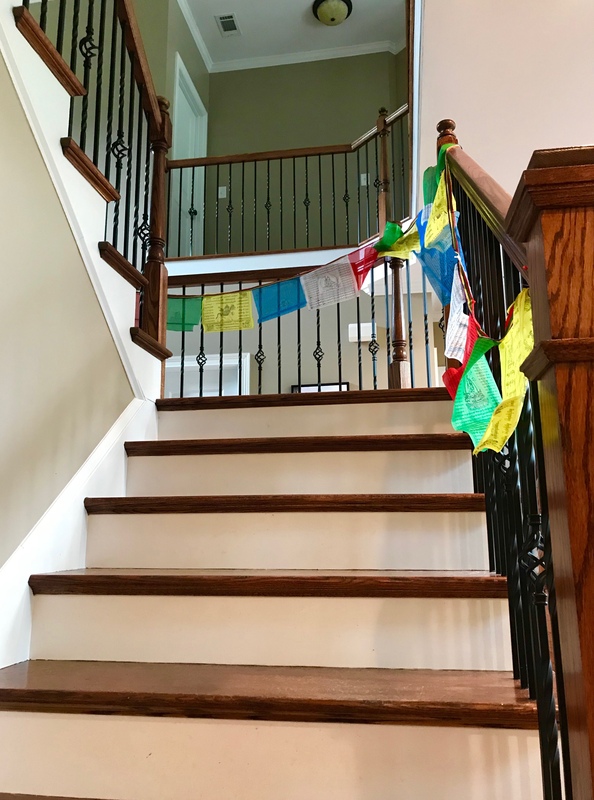 Greg Brown brought authentic Nepalese prayer flags like the ones that line the route from base camp at Everest and strung them on the bannister. I’ve had visitors, which is keeping me somewhat sane, and easing the demands on FMG. Reggie and JJ Pineda have come by to see me and bring us food, in fact Reggie hung out all day Sunday so FMG could go to a birthday party. Greg Brown has come by a few times bringing lunch and companionship. Todd and Preston came by the first weekend after surgery. I can’t thank all of them enough for their moral support and for getting FMG a little slice of her own freedom once in a while. It’s still a long road ahead, I won’t bore you with frequent posts highlighting all the speed bumps sure to be encountered. The good news? I am looking forward to being able to ride that road, pain free, in the not that distant future. Way to go Geoff! I’m proud of you for getting through this ordeal. Continuing to lift you up with positive vibes. A well written reminder that no two surgeries are the same and the challenges at home can not be compared to another’s. You’re doing great (Dee Dee keeps me posted). The pay off will be priceless.